The Sony Walkman cassette player took one step closer to the grave on Monday when Sony announced it would stop selling the portable music player in Japan. The company stopped manufacturing the cassette playing Walkman for the Japanese market in April, and says it is selling through the end of its Japanese stock now. Cassette lovers in the U.S., however, have nothing to fear. Sony said it will continue to manufacture the aging portable music player in China for overseas markets, including the U.S., according to the Associated Press. The Walkman isn't the only piece of legacy tech to get the boot from Sony in recent months. The electronics manufacturer also announced in April it would stop selling 3.5-inch floppy disks in Japan. Before the Walkman, portable music playing was virtually non-existent with your choices confined to either a small battery-powered AM/FM radio or a large boom box that could typically dry up 6 or 8 D-cell batteries in just a few hours...if you were lucky. It's not hyperbole to say the Walkman--and the wave of cassette playing imitators that followed it--was as ubiquitous in the 1980s as the iPod is today. Its influence was so important that PC World in 2005 ranked the Walkman as one of the 50 greatest gadgets in the past 50 years. Interestingly, Sony's announcement for the end of the cassette playing Walkman comes just two days after the iPod celebrated its ninth birthday. Apple launched the original iPod on October 23, 2001. Still in the U.S. but for how long? Believe it or not, Best Buy currently sells one model of the cassette-playing Walkman for $40. The device includes a digital AM/FM radio with 33 station presets, Mega Bass stereo sound, LCD display and a battery life claim of up to 35 hours on 1 AA battery. By comparison, the original 1979 Walkman could only play cassettes and cost $200. But even at $40 how much longer can a portable cassette player last in a market where you can buy a no name MP3 player with 1GB of storage for under $15? The AP reports that Sony has sold about 220 million Walkman cassette players worldwide since launching the device in 1979. Most of those sales, however, came in the device's first 20 years when Sony announced in 1999 it had sold 186 cassette playing Walkman devices worldwide. 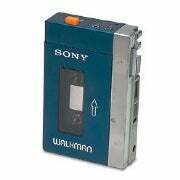 That means in the last eleven years, Sony has sold just 34 million portable cassette players. Apple, by comparison, sold over 50 million iPod devices for the 2010 financial year. Whenever Sony's portable cassette player does shuffle off U.S. shelves for the last time, the Walkman name will live on in cell phones and standalone MP3 players such as the Walkman X Series. But Sony has a long way to go if it wants the Walkman MP3 player to gain the same popularity its cassette player enjoyed during the 1980s. Apple's iPod commanded 77 percent of the MP3 player market in the U.S. between January and July, according to market research firm NPD. Over that same time period, Sony's MP3 players claimed just 2 percent of U.S. users. This story, "Sony Walkman Cassette Player Dies In Japan, Lives On in U.S." was originally published by PCWorld.